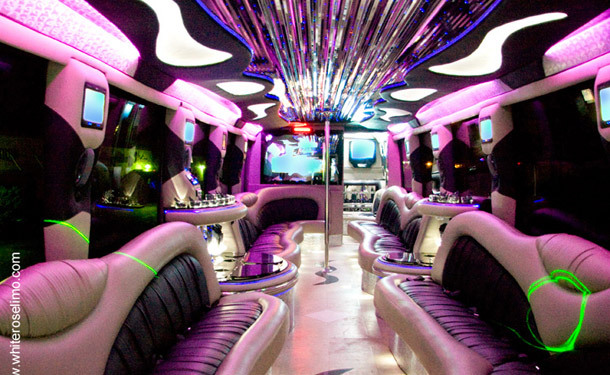 These party buses are manufactured in the OC to the highest standards and equipped with high-end touches—from leather interiors to laser light shows—you’ll not see anywhere else. Turn your night out into one you’ll never forget. And no party buses in the OC can be called complete without complimentary cocktails! The fully stocked bar comes equipped with all of your favorites but premium labels and specialty liquors can be added for a nominal fee. Our customers are our best advertisement. We go out of our way to make their day (or night) and many have been kind enough to leave us a few words in thanks. So you don’t have to believe us—believe them! Our experienced drivers and helpful office staff make your party bus rental as hassle-free as possible so you can get to the fun faster. We take the worry right out of your hands. Turn everyday events into unforgettable ones with all the pomp and circumstance you can handle. From birthdays to weddings and anniversaries and even “girls” and “boys” night’s out, party buses in the OC have a way of giving the ordinary something a little extra. So give us a chance to give you our best. Experience the luxury, excitement, and ease with which we’ve charmed thousands of satisfied clients over the years. It’s your turn to experience California a whole new way whether you’re here for a week or have lived here your entire life. Who knows, maybe yours will be our next featured testimonial! Parties On Wheels Across California and Beyond! 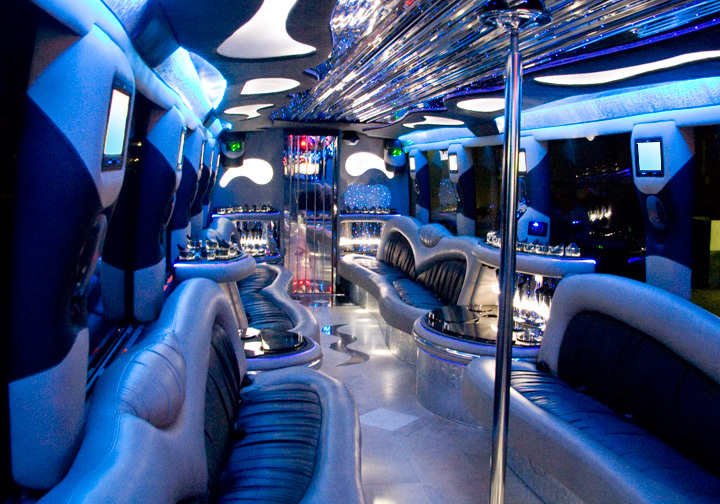 Luxury Party Buses in the OC make getting there more than half the fun. 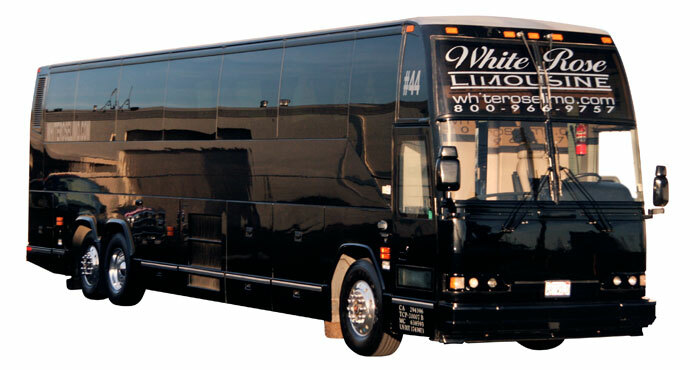 White Rose Limo custom builds each one of these luxury party buses right here in the OC and infuses each one with the true California spirit from the wheels up. They’re rolling parties on wheels complete with everything you’ve come to expect from a decent nightclub—lights, music, cocktails, dancing, and more. But this time when the door opens you don’t have to worry about finding your way home because you’re already right where you need to be! 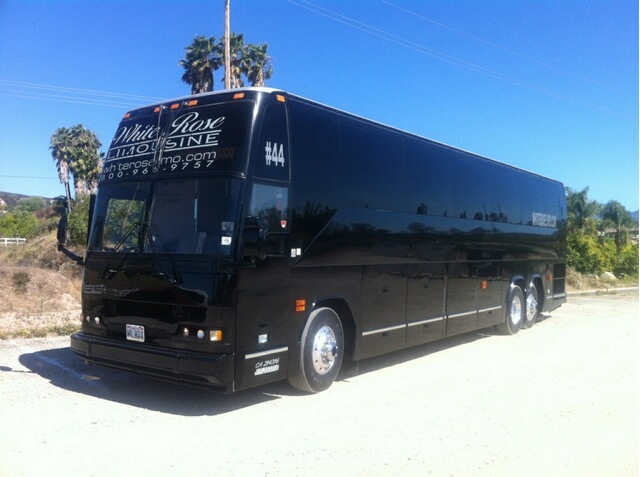 These party buses are licensed in the OC and can transport passengers throughout California—from the coast to Wine Country and beyond! Trips to Las Vegas—Sin City—can be arranged as well if you and yours are feeling lucky or have tickets to one of the world class shows that dot the Strip. And with the ability to seat up to 44 passengers comfortably you can take all your friends … and maybe even some of your family. These buses are loaded with high-end amenities, multimedia entertainment, refreshments, and more just to make the time you spend “en-route” unforgettable. 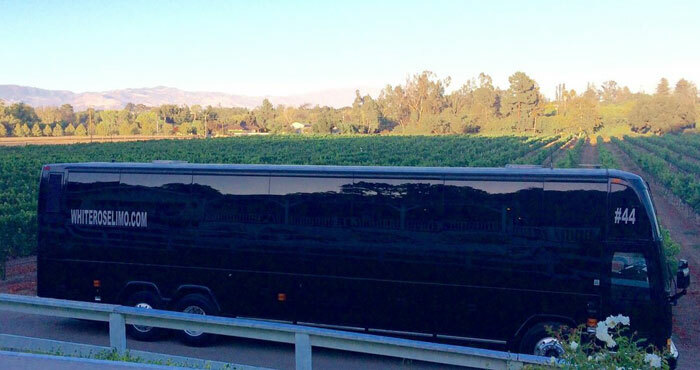 The Temecula Wine Tour is one of the most requested services for this bus (and one of our favorites). There’s nothing quite like sipping a glass of your favorite vintage while traveling in the lap of luxury through beautiful California Wine Country. The tour is the perfect Birthday, Graduation or Anniversary gift! 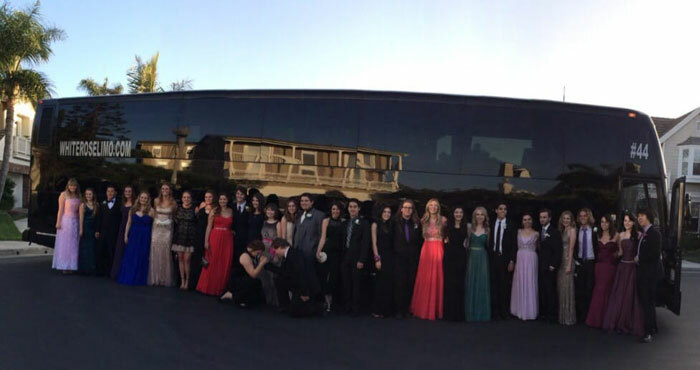 Party buses in the OC make the long trips to Las Vegas, San Diego or Palm Springs fly by. With an on-board restroom there’s no need to stop off. Plus, you can start your Happy Hour before hitting the Gas Lamp Clubs, the Chargers Game, or the Del Mar Races. The multiple LCD TVs are perfect for keeping anyone from 5 years of age to 95 entertained. Bring some favorite DVDs or plug in your compatible mobile devices to broadcast on your own personal station …it’s all up to you. Some businesses even rent our party buses to transport their employees to and from corporate retreats and show video seminars on the screens while they ride in air conditioned comfort. 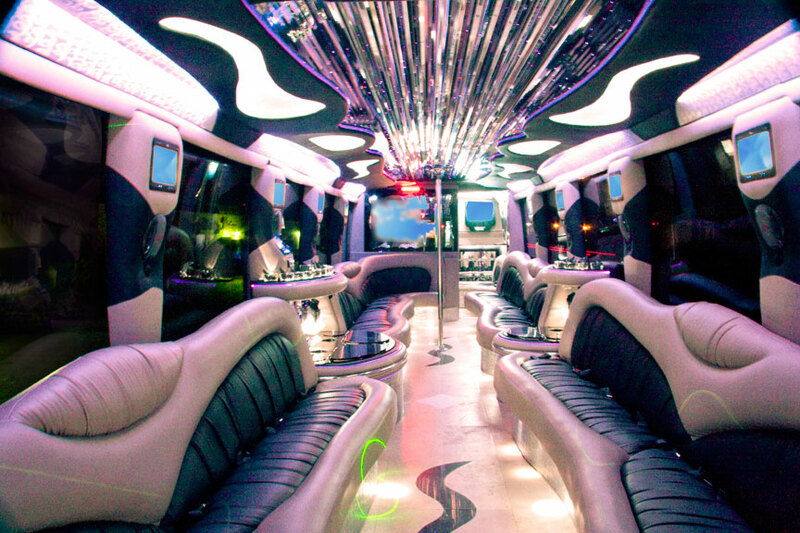 When you rent one of our party buses in the OC, we handle all the heavy lifting for you. All you have to do is decide how many are in your group and where you want to go. Let us know and we’ll plan a route that accommodates all your pick-ups. And if you’re having trouble picking a destination, we can help there too! We offer package deals, tours, and can suggest hotspots for fun-seekers from 5 to 95. Give us a call today and let us help make your special event more than enjoyable. Let us help you make it unforgettable. The original service provider for Party Buses in OC!